We listen your demands on Design and Structure of the Boat and deliver to you the Plans ready to construct. always keeping an eye on efficient, producing a good product with and excellent price/quality rate. We are a young company with a great capacity to listen your ideas and fulfill your expectation. From the beginning we've been working with Mast Builders, Boatyards and Designers. This experience gave us a great flexibility in the Marine Industry. Collaborations, Designs, FEA, Structures, Motorboats, Sailboats, Systems. 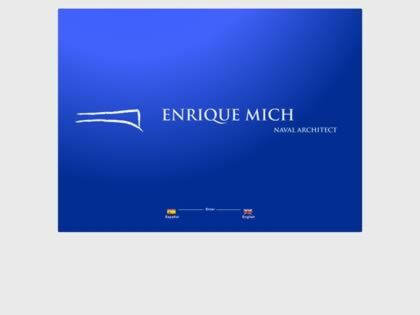 Web Site Snapshot: If available, above is a snapshot of the Enrique Mich Naval Architect web site at http://emich.com.ar as it appeared when this site was added to the directory or last verified. Please Note that Boat Design Net has no involvement with the above web site; all content and images depicted in the above thumbnail are the property and copyright of Enrique Mich Naval Architect unless otherwise noted on that site. Description: We listen your demands on Design and Structure of the Boat and deliver to you the Plans ready to construct. always keeping an eye on efficient, producing a good product with and excellent price/quality rate. We are a young company with a great capacity to listen your ideas and fulfill your expectation. From the beginning we've been working with Mast Builders, Boatyards and Designers. This experience gave us a great flexibility in the Marine Industry. Collaborations, Designs, FEA, Structures, Motorboats, Sailboats, Systems.